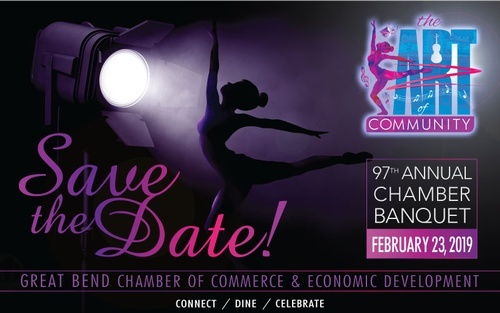 Please save the date for the 97th Annual Meeting & Banquet for the Great Bend Chamber of Commerce & Economic Development. The evening will include a cocktail & social hour, catered dinner, live music and the special recognition of our community award winners. Deadline to reserve seats is Monday, February 11th, 2019. This year's banquet will connect attendees and the community using the medium of performing arts. Guests will be delighted by a wide variety of entertainment - stay tuned for more details! Reserved Corporate Tables & Single Tickets Available Beginning November 1st. Deadline to reserve your seat is Monday, February 11th, 2019.